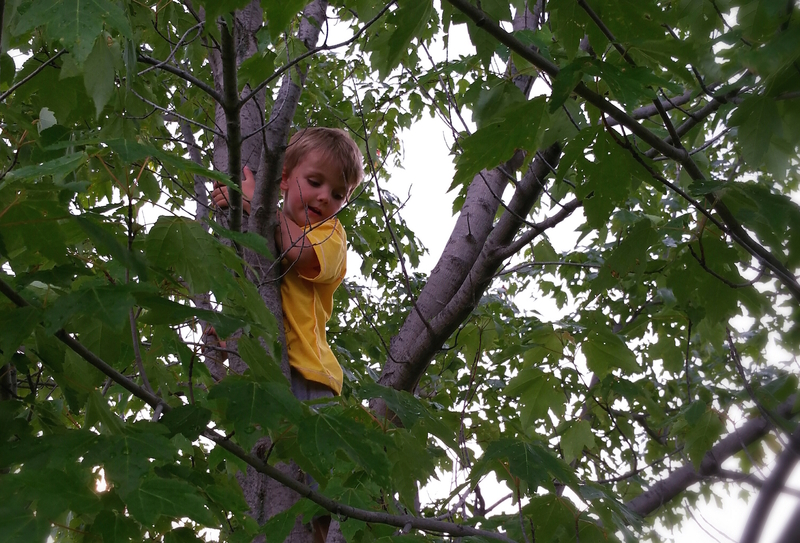 The other day we went “monkey climbing” in our front yard. We have a decent sized tree that has just the right thickness of branches and enough spacing to get 15-20 feet up in a hurry. For our little guys it’s the perfect starter. Elliot was pretty eager to get some elevation and was probably ten feet up with a little help. The whole time I was coaching him with my climbing basics: firm footing on at least one foot, letting your legs do the work, and securing a strong grip with your hands in case a branch gives out. Ten feet wasn’t high enough for him, and he wanted to go higher. I dropped a question that made him pause, “How are you going to get down?” He then realized he hadn’t considered the effort to get back down. He had forgotten where he came from. After a quick moment he asked for help and I climbed up to where he was to guide his hands and feet back down. I guess it’s a good lesson for life just as much as it is for tree-climbing. No matter how much you grow, learn, succeed, or achieve, don’t forget where you came from. It’s easy to constantly move up in life with little thought of where you’ve been, but sometimes where you’ve been is the same place where someone else is navigating. We can help guide them and invest in their journey as others have done for us. It’s the photographer who blogs about the beginning to help give someone a start. It’s the mother who remembers her childhood, and empathizes with her kids. It’s the lead pastor who remembers his days as a subordinate and gracefully mentors his staff. It’s the “saint” who remembers their days as a “sinner” and loves others as unconditionally as Christ loves them. The next time you climb up, don’t forget where you came from. Chances are there’s someone who needs a little guidance and you’re just the person they need.